Apparently I have a thing for French cuisine. Yesterday, during the brunch I threw for my boyfriend (congrats to him on receiving his Master’s!) I made these crepes, and they were a hit. I’ve made many crepe recipes over the years, and I’ve found it’s hard to go wrong–but these ones are a classic! I prefer sweet crepes, but the sugar can also be omitted: they’ll still be delicious. 1. Whisk together flour, milk, water and beaten eggs. 2. Add butter, sugar, salt, vanilla and whisk until combined. Mixture should be liquid. 3. Heat small amount of butter (or margarine) in the skillet, coating the bottom of the pan as it melts. Keep the heat on medium-high. 4. Pour in desired amount of batter (I usually do about 1/4 of a cup) into heated skillet, tilting pan to spread the batter very thin. The crepe will cook very quickly; watch the heat of the pan to prevent overcooking. The edges will turn brown and the crepe should bubble; flip (about one minute) and cook the other side. 5. Remove from heat (the other side will cook faster than one minute) and serve with desired fillings: cinnamon and sugar, fruit, jam, whipped cream, Nutella, etc. 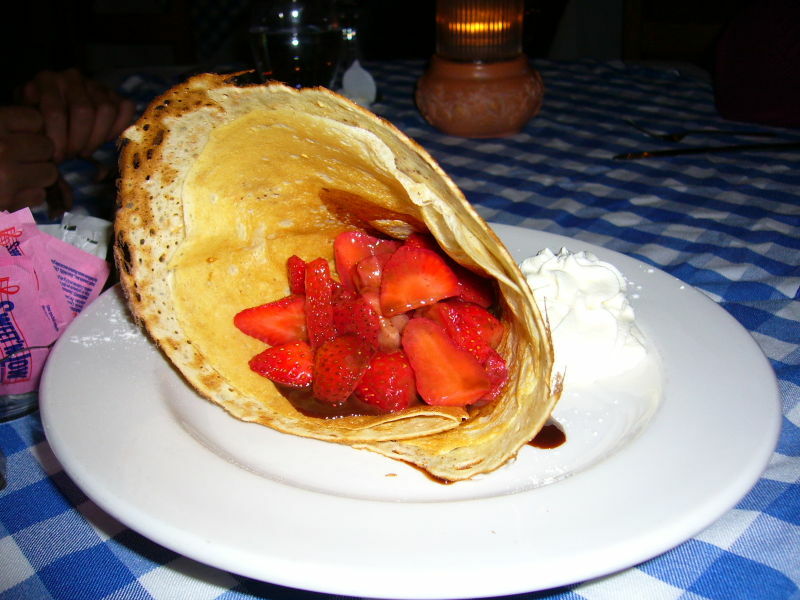 What are your favorite crepe fillings? Or recipes? While creating this blog, I vowed I include a recipe section, to be filled with my fabulous attempts at healthy eating, at least the attempts that turned out so well after about fifteen tries. 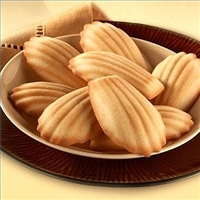 But today, I am going to post about Madeleines, my favorite French cookie-cakes, which are not exactly healthy, but which I do have a delicious recipe for. I first tasted Madeleines, many moons ago, in my French class during the 6th grade. I forgot about Madeleines until my senior year in college, while reading Marcel Proust’s À la recherche du temps perdu (translated as In Search of Lost Time and Remembrance of Things Past) and was able to make this recipe as part of my thesis presentation…any excuse to snack during class. Whip the butter and sugar on high until fluffy. Add the extracts and orange zest to the butter. Turn the mixer to low speed and add the eggs, one at a time. Beat the mixture on medium for 3 minutes, until the mixture is lighter and quite fluffy. In a separate bowl, combine the flour and baking powder. Very carefully fold the flour and baking powder into the egg mix. Once smooth, place in refrigerator for 2 hours. Preheat the oven to 375 degrees F. With a generous hand, grease 2 standard madeleine pans (I spray liberally with olive oil cooking spray) and press the cold batter into the molds. Bake them for 10 to 13 minutes, until they are puffed and turn golden brown. Invert the pans onto wire racks and give them a hard tap to remove the cookies from the molds. They are ready to serve. (For more on my thoughts of Marcel Proust, visit my thesis blog about exploring Epiphanies). “I raised to my lips a spoonful of the cake . . . a shudder ran through my whole body and I stopped, intent upon the extraordinary changes that were taking place.” Marcel Proust, discussing a madeleine.